In the small examination room of Lakuri Bhanjyang's health post, a temporary shelter made of corrugated zinc sheets and wood, Bali Raj Shahi, the health post in-charge, listens intently to 75-year-old Chini Maya Tamang. 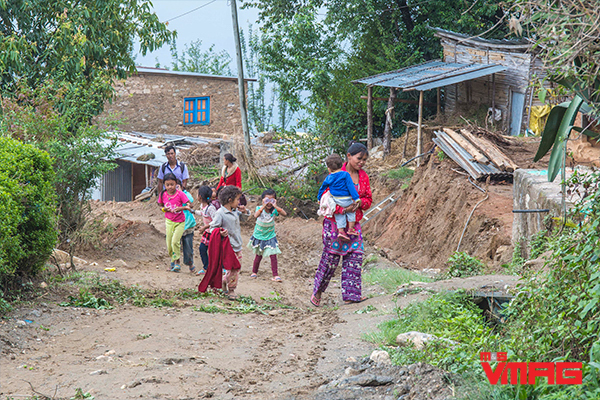 Tamang walked for almost an hour from her house to the health post to see a health assistant. She has been having difficulty breathing, and the night before, she had coughed for hours. Shahi listens intently to her and then measures her blood pressure with a brand new blood-pressure monitor set. The set, along with almost half of the medicines in the health post, was provided to the health post by Health Advancement Programs to Serve All (HAPSA), a not-for-profit NGO. Even the temporary building, out of which the health post is currently operating, was built by the NGO in June 2015, two months after the earthquake reduced the health post's original building to rubble. Today, the health post provides primary health care service to more than 2,000 villagers of Lakuri Bhanjyang and other outlying villages. Basic health care wasn't this accessible here even just a few years ago. Many villagers preferred to go to health centres in Kathmandu, rather than visit the village's government-run health post-which wasn't well-stocked with medicines and didn't have the necessary medical equipment. A large part of the credit for the revival of the health post goes to HAPSA and its founder Ramu Kharel. At Lakuri Bhanjyang, Kharel's organisation partnered with the District Public Health Office (DPHO), Lalitpur, and the local community. The health post operates under a private-public partnership model. The organisation's aim is to strengthen existing primary health centres in non-urban locations across Nepal, improve how they are run, and in the process, decrease out-of-pocket payments for villagers who would otherwise need to travel to faraway cities to get basic health care. HAPSA adopts different models depending on the villages where it works. But a common factor in all its models is the Health Advancement Committee (HAC). In every village that Kharel's organisation works, it creates a committee comprising local members of the community. The committee is given the task to oversee the day-to-day operations of the health centre and manage it, while HAPSA provides the committee the support it needs to strengthen the health centre. "It's important to have locals in the committee, because they have a better understanding of their community and its healthcare needs. They also feel a sense of ownership," says Kharel. Under the private-public partnership model at Lakuri Bhanjyang, the government provides the health post with the basic essentials it usually provides to government-run health posts; HAPSA provides the health post with medicines and medical equipment and conducts health camps; and HAC looks after the management of the health post. HAPSA was founded in 2010 as a student organisation by Kharel when he was attending the University of Texas at Austin. Back then, it only conducted health education awareness programmes in parts of India and Nepal. But after the devastating earthquake that struck Nepal in 2015, the organisation, now a registered NGO in the US and in Nepal, shifted its focus solely to Nepal, with an aim to strengthen local health systems in the country. The first health post Kharel helped set up was actually at Ghumarchowk Village (near Sankhu) in Shankarapur Municipality. When the earthquake struck Nepal in April 2015, Kharel was a third-year medical student at the University of Texas Southwestern Medical Center (UTSW), in Dallas. When he came to know that the devastating earthquake had completely destroyed the health post in Ghumarchowk Village, he knew he had to do something. In 2013, when he was a first-year medical student, he had spent a month volunteering in a school in Ghumarchowk Village. He had conducted a month-long programme on hand hygiene and health awareness. "During my volunteer stint there, I noticed a huge gap between the kind of health service the villagers actually wanted and what was provided at the government-run health post down at Sankhu. The health posts' management committee did not even have a representative from the village," says Kharel. In December 2014, HAPSA conducted a health camp at the village. "Even though the villagers were quite happy with what we did, we weren't quite satisfied with just doing a health camp, a one-off intervention. We knew we had to do more." Post-earthquake, with an aim to support the Ghumarchowk community and to provide long-term healthcare solutions in Nepal, Kharel started a GoFundMe page. He ended up raising more than USD 20,000. He asked his cousin Pankaj Bhattarai, President of HAPSA-Nepal, to go to villages around Kathmandu and find out where and how the organisation could help. Bhattarai zeroed in on the village of Lakuri Bhanjyang. 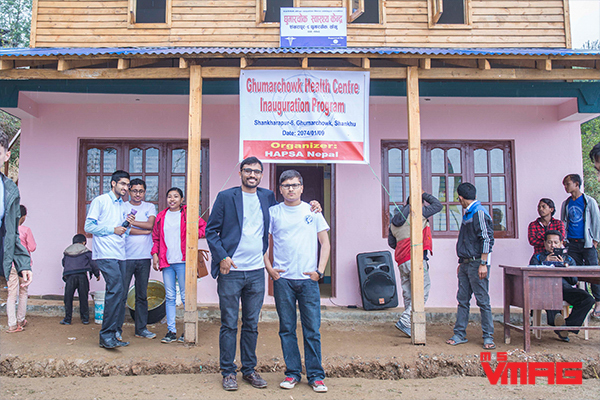 At Ghumarchowk, HAPSA was able to convince the villagers to let the organisation use the village's community hall and turn it into a health centre. "If we'd had to built a new health centre, it would have exhausted whatever little fund we had. 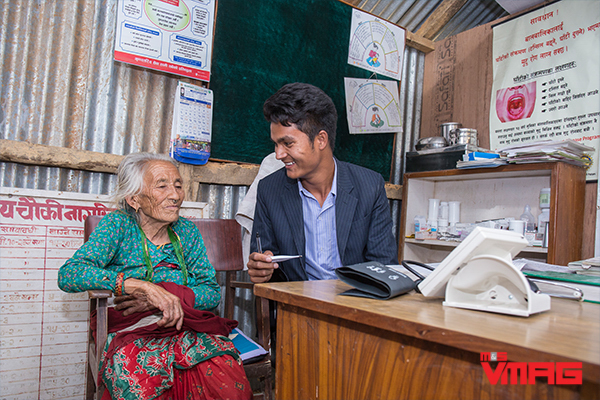 We wouldn't have anything left to do anything else, let alone purchase medicines and equipment," says Kharel. Kharel's organisation then convinced From The Ground Up (FTGU), an NGO, to build a community hall for the village. The villagers donated 10 trees from their community forests for the new community hall. Ghumarchowk's health centre, with its concrete building, fresh coat of paint, brand new doors and windows, make for an impressive sight in a village where the majority of the houses are built out of mud and rock. What is more impressive is how well-stocked, well-equipped (it has several BP sets, nebuliser machine, glucometre devices), and well-staffed the centre is: it is manned by two health assistants. The model that HAPSA has adopted at Ghumarchowk is a community-private partnership model. 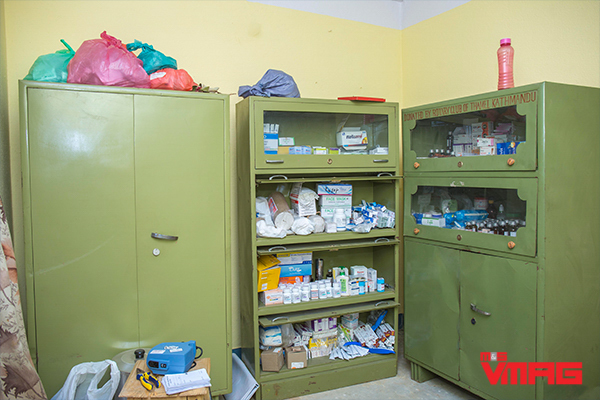 Under this model, HAPSA provides the health centre with medicines and medical equipment, pays the health assistants, organises health camps and sends over doctors regularly, while HAC oversees the day-to-day operations. Patients at the health centre are charged a nominal fee of Rs 25 for consultation, and medicines, except for the ones HAC purchases, are provided free of cost. At Lakuri Bhanjyang's health post, on the other hand, consultation and medicines are both provided free. At both Ghumarchowk and Lakuri Bhanjyang, the availability of a well-equipped health centre has been instrumental in giving villagers the option of not having to travel to towns and cities for basic health care. At Ghumarchowk, where villagers earlier sought medical care only when it was absolutely necessary, today the villagers head to the village's health centre and until their problems get worse. "The people are more aware of the importance of seeking quick medical care," says Hitman Tamang, member of HAC Ghumarchowk. HAPSA also occasionally conducts camps that provide specialised medical treatments. On April 15, 2017, HAPSA, in collaboration with Tilganga hospital, conducted at Lakuri Bhanjyang a cataract screening and general checkup health camp. After that programme, the number of patients at the health centre increased significantly. "Before the camp, we would see only a patient or two in a week," says Shahi. One of the key aims for HAPSA for organising the health camp was to make villagers aware of the services available at the healthpost and to encourage them to come there instead of going to cities and towns. More than 70 villagers were tended to by doctors at the camp and seven of them were found to have cataract, and all seven were offered free cataract surgery at Tilganga Hospital. "For every patient that came to the health camp, HAPSA created an individual file, complete with their medical condition and diagnosis. The patients were then told that their file would be kept at the health post, in order that the health assistant could refer to it in the future and be able to diagnose them better," says Neha Malla, vice-president of HAPSA-Nepal. These measures have had a very discernible effect on the locals. After the health camp, the number of villagers coming to the health post has increased multifold. Both Ghumarchowk and Lakuri Bhanjyang have several things in common. They are both just a few kilometres away from the city, and the road that connects these villages to their nearest towns is a barely navigable dirt road prone to landslides during the monsoon. (From Lakuri Bhanjyang, a bus runs to the nearby town of Lamatar twice a day, one in the morning and one in the afternoon. But for Ghumarchowk residents who don't have their own vehicle, their only option is to walk for at least an hour to reach the nearest town of Sankhu.) In both these villages, Tamangs are the predominant ethnic group, literacy rate is low, and alcoholism is a severe problem. Without a well-equipped and staffed health centre in the village, the villagers earlier had no option but to spend time and money travelling to cities for primary health care. Kharel too grew up in a similar setting. As a young boy growing up in a village in Gulmi, he was used to seeing people from his village travel for more than 12 hours on foot and bus to reach the nearest health centre in Palpa. 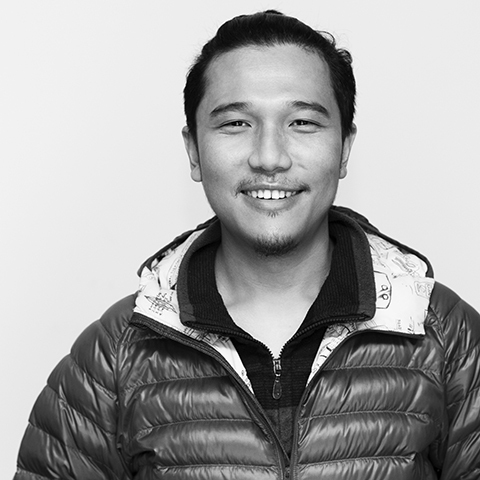 "Even though I didn't understand much then, I knew that it shouldn't be this way; I knew that healthcare should be accessible to all," says Kharel. 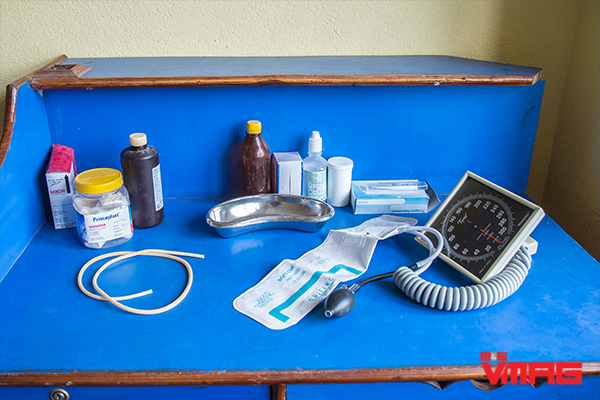 More than 10 years later, the situation hasn't improved much in Nepal: primary healthcare is still inaccessible to many. But at Ghumarchowk and Lakuri Bhanjyang, Kharel's unrelenting work has resulted in villagers having access to not just primary healthcare, but quality healthcare at their doorsteps. His task ahead, he says, is to replicate these two models (whichever is more feasible) in as many villages as possible.